This time of year, window dressers have one of two options if they want to be topical: Halloween or politics. Men's store Rothman's, in Union Square, has taken the second approach, assigning its window mannequins each a giant cardboard Obama or McCain head. 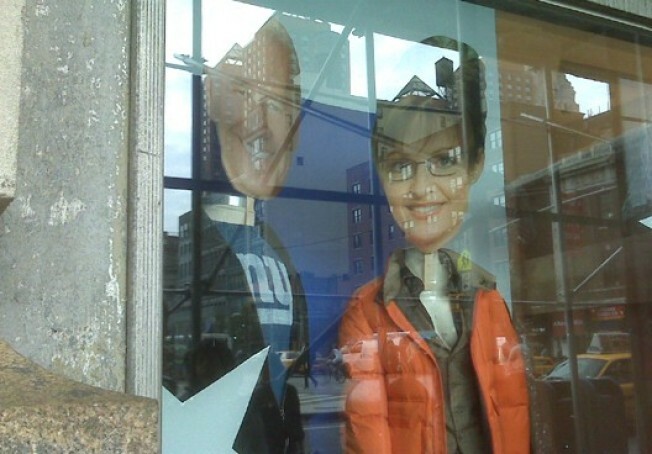 The result is very non-partisan, but it's still opinionated: Whoever designed the display put the VP candidates squarely in their place by only giving them one mannequin each, and sticking them in the smallest window. If that wasn't humiliation enough for the Palin bobble-head, today blogger Restlus noticed that her dummy's head was gone completely. Much to his disappointment, by this afternoon it had returned.